Elite Pharma Pvt. Ltd. is sole distributor of M/S Zhanjiang A & C Biological Ltd., China for their products related to LAL/TAL test technique, with its brief description as follows PYROGEN = ENDOTOXIN?! In the pharmaceutical industry, pyrogen test has long been taken as one of the important tests for the safety of injectable drugs. Afterwards, people realized that pyrogen was bacterial endotoxin, to control endotoxin contamination, can eliminate the harmfulness of pyrogen. A new way to deal with pyrogen has been found - Bacterial Endotoxin Test (BET). The important role in BET is Limulus/Tachypleus Amebocyte Lysate (LAL/TAL). In the U.S.A, lysate is prepared from the blood of Limulus Polyphemus and is known as Limulus Amebocyte Lysate (LAL). In Japan and China , the blood of Tachypleus Tridentatus (a type of crab) is used to prepare lysate and this is called Tachypleus Amebocyte Lysate (TAL). When we mention LAL, we should thank to the great scientists, Frederick B. Bang etc. who invented LAL and established the method of LAL Test. LAL or TAL is really a wonderful thing! It is the kind bestowing from the nature for human beings, which enables us to avoid the harmfulness of pyrogen more easily. Today, poyrogen test is no longer the necessary test for all the injectable drugs. BET is becoming more and more the replacement of it and has become a kind of developing trend. To carry out TAL Test, we need TAL tube incubator, vortex mixer, micro-pippettor as basic equipment. Chemicals and reagents, required during the course of test, consist of TAL Test vials (single test or twelve tests pack), CSE vials, TAL reagent water (5 ml or 100 ml pack). 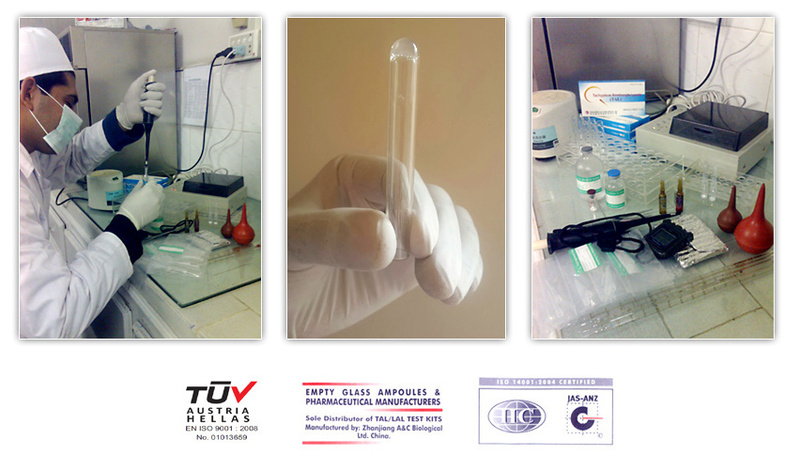 However, one test requires 4 single test vials and one fifth of CSE vial and 25ml TAL reagent water. With one CSE dose in use, which is one fifth of vial content, there is no limit to the number of products or batches to be tested, at one time, but CSE vial has to be used within 14 days if properly stored i.e. refrigerated at 2 oC to 8 oC. Similarly, use of 12 test vial and 100 ml TAL reagent water vial, when number of products tested are more than one, can help in reducing, total cost per test (All reagents + TAL water included), which on the average comes to RS. 100.00 per test. NOTE: 16% GST & 1% FED is applicable on all above items.